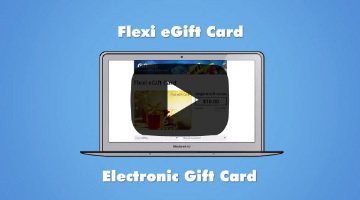 Watch the video A Flexi eGift Card is an electronic gift card that lets you choose where you'd like to shop! In the past if you were given a gift card for a particular shop but didn't want to buy anything from that shop, you were stuck. But now with a Flexi eGift Card, you get to choose at which shop you spend your gift. What's more, you may be able to split your Flexi eGift Card and spend it at different shops! For example, if you have a $30 Flexi eGift Card, you could choose to split it up into a $20 Myer eGift Card and a $10 iTunes eGift Card. Instant delivery via email. Works on desktop/laptop or smartphone/tablet. No account or registration required. Open the eGift Card then select where you'd like to spend it. If you wish to you can also split the eGift into any combination of gift cards up to the total balance available. Where can I spend a Flexi eGift Card? Treat your electronic gift card (egift card) as cash. Any person who learns the URL of your egift card can use it, therefore it is your responsibility to keep your egift card safe by keeping the URL private. We recommend you keep the original egift card email safe and take all measures necessary to secure your email. Do not open your egift card on a public or shared computer terminal. Lost or stolen egift cards will not be replaced or refunded. Not redeemable for cash. When you choose to redeem your egift card by converting part or all of the value into a participating merchant's egift card or voucher, the validity of that portion of your egift card will change to a shorter period. Please pay attention to the expiry periods and dates shown. Any merchant egift card or voucher you select is subject to that merchant's terms, conditions of redemption and expiry dates. Any unused value after the expiry date of any egift card or voucher will not be refunded or credited. When you convert value into a participating merchant's egift card or voucher, the conversion is final and cannot be reversed. Egift cards and vouchers are not reloadable.